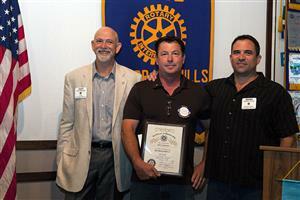 On August 7, President Coy Baugh inducted Jeff Garrahan to the El Dorado Hills Rotary. A little bit about Jeff: He is the owner/ operator of Garrahan Electric, Inc., providing electrical, low voltage and design build services for commercial, industrial, schools and public works projects. Married 18 years to Jenelle, a real estate appraiser. Together they are raising their 12-year-old son, Jason, who is a competitive soccer player and avid skateboarder. Also in their household: donkeys, goats, chickens, peacocks, cats, a dog and ducks. They obviously live on acreage. Jeff keeps occupied with motorsports, including sand duning, ATVs and sand cars. Jeff was sponsored by member Mark Foltz. A little bit about Jeff: Owner/ operator of Garrahan Electric, Inc., providing electrical, low voltage and design build services for commercial, industrial, schools and public works projects. Married 18 years to Jenelle, a real estate appraiser. Together they are raising their 12-year-old son, Jason, who is a competitive soccer player and avid skateboarder. Also in their household: donkeys, goats, chickens, peacocks, cats, a dog and ducks. They obviously live in acreage.